I went to TMR on Tuesday evening but didn’t find too much outside of two cases of old-ish white wine that may or may not still be good. 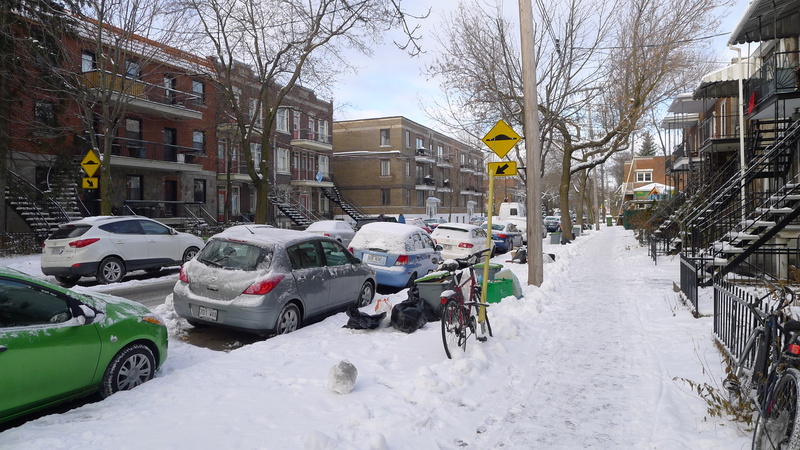 This morning’s run through Rosemont (between St Hubert and Papineau) was fairly productive, though. It was my best Rosemont route in quite some time, this in spite of the weather turning for the worst. My first finds came from this pile. 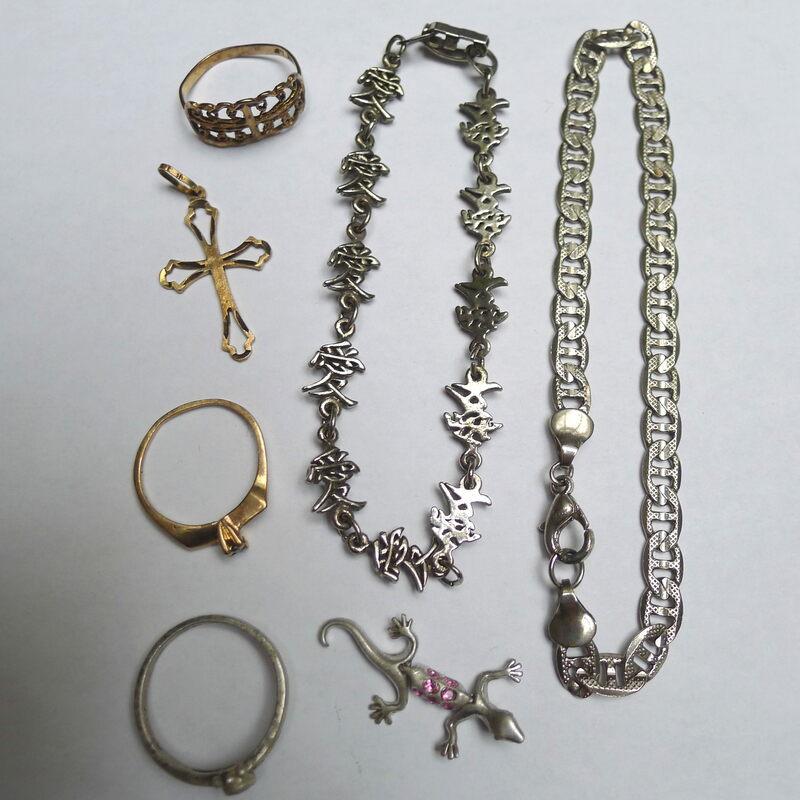 Someone noticed me looking through the things and told me they belonged to his neighbour who had passed away. 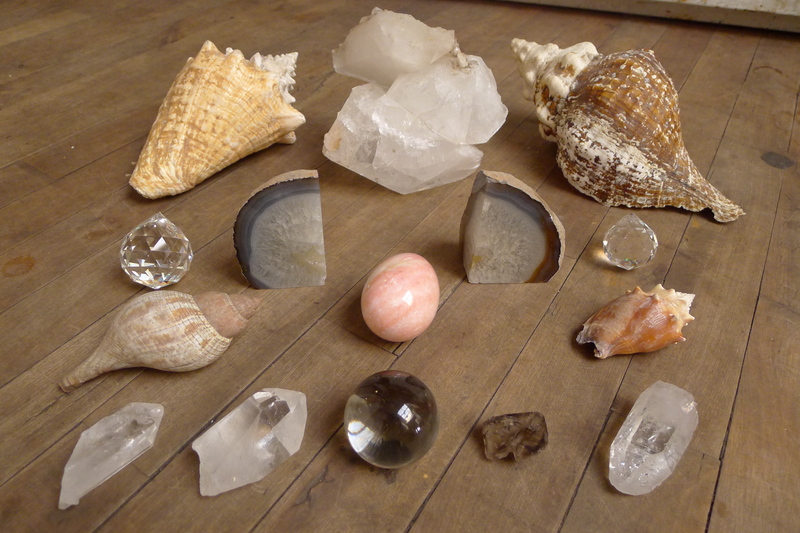 One bag contained a bunch of interesting rocks, shells, and crystals. The pink “egg” in the middle is kind of cool, it’s made of some kind of rock. There’s also a round glass ball and two refracting light crystals. 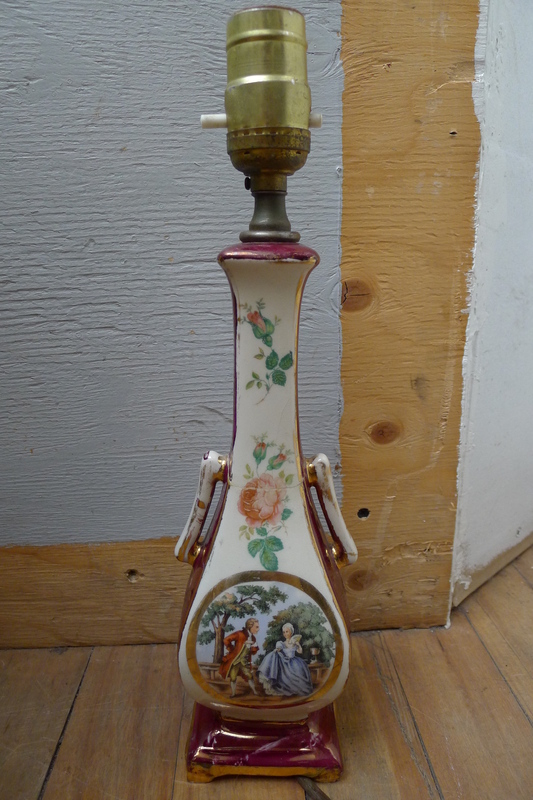 I like this cute ceramic lamp. It looks fairly old, there’s no markings but the design looks similar to a lot of “Made in Japan” pottery from the 50s. It broke in half at one point but it was glued back together, you can hardly tell it was broke at all. I tested it and it works great. 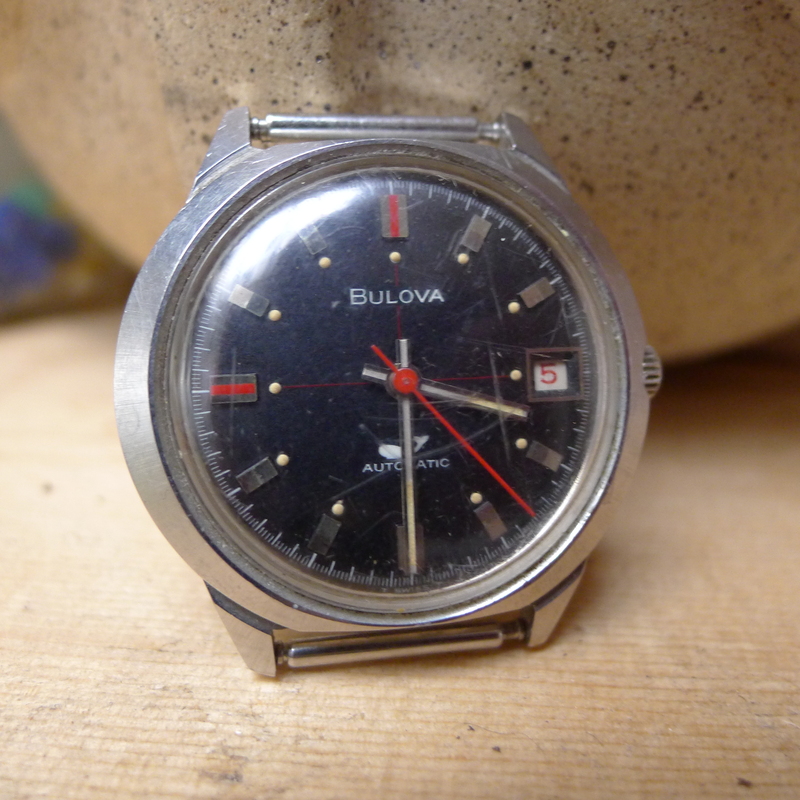 I also found this automatic wind Bulova watch sans band. It’s a pretty good quality watch and seems to work fine. With a new, scratch free crystal and a band this could probably sell for around 100$. As is, maybe 30$? There were a few different tarot decks in this pile as well. Unfortunately the cards were out of their package and I couldn’t track them all down – I’m missing 4 from one pack and 2 from another, which from my understanding makes them more or less useless. Oh well! They might still be useful to someone for arts and crafts or something. Not far away was this pile on St Zotique near Chambord. Someone was clearing out some old stuff for one reason or another. It was hard work (I didn’t bring my bike trailer today) but I managed to carry home this box of dishes. My apartment can use the glasses but mostly I appreciated the 1970s earth-tone pattern of the dish set that reminds me of my Grandma’s house. 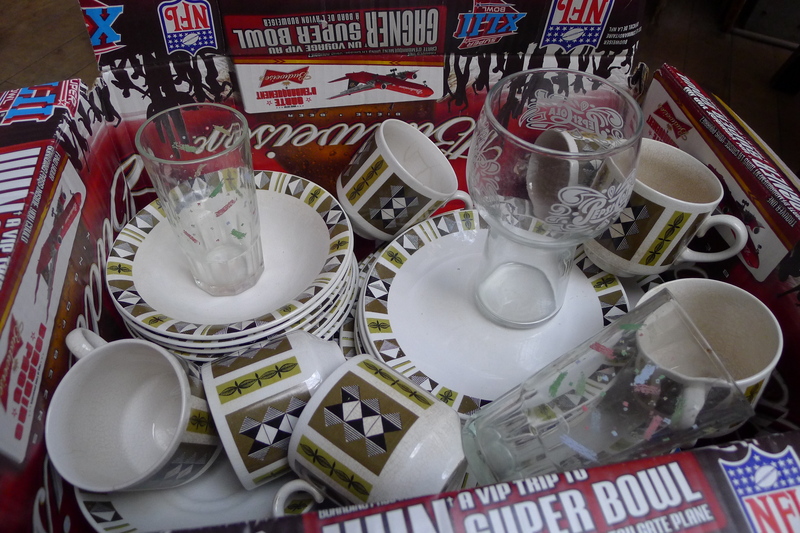 That being said I don’t really need any dishes at the moment, I’ll see if any friends can make use of them. I also found a box full of trophies. Most were either unmarked or from the 80s and 90s. 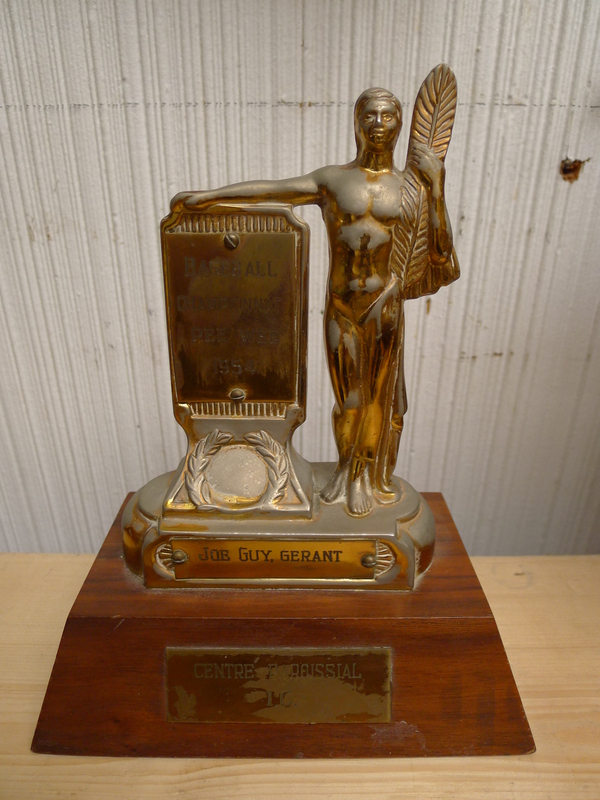 This one was the exception, awarded for a pee wee baseball tournament way back in 1954. It’s made of sturdy metal and has an art deco look to it. I think it’s the oldest sports trophy I’ve seen thus far, it’s interesting to see how the style changes with time. However, most of what I brought home from this place were old books. These are 1940s children’s books, many of which are pretty religious. They’re all in amazing condition for their age. 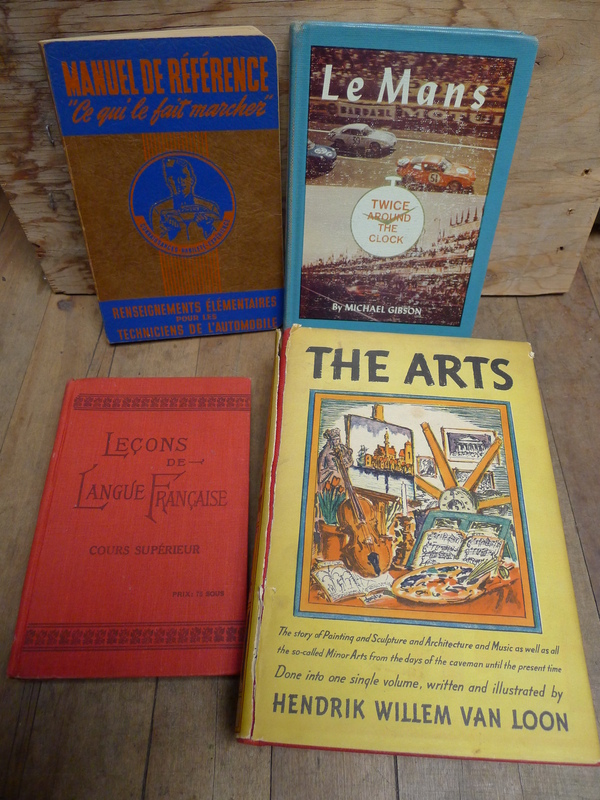 A few are by Guy Laviolette, who seems to have been a prolific author of these types of books back in the day. Someone wrote their name on all the covers, I blacked them out in the photo for privacy. 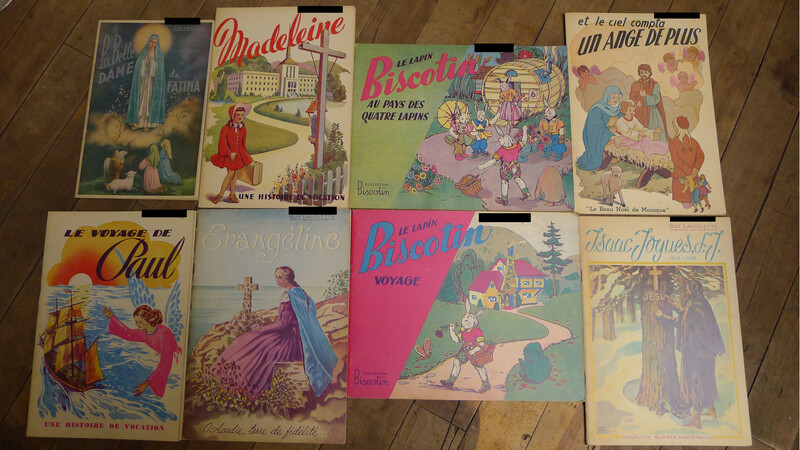 There were also these old graphic novels. 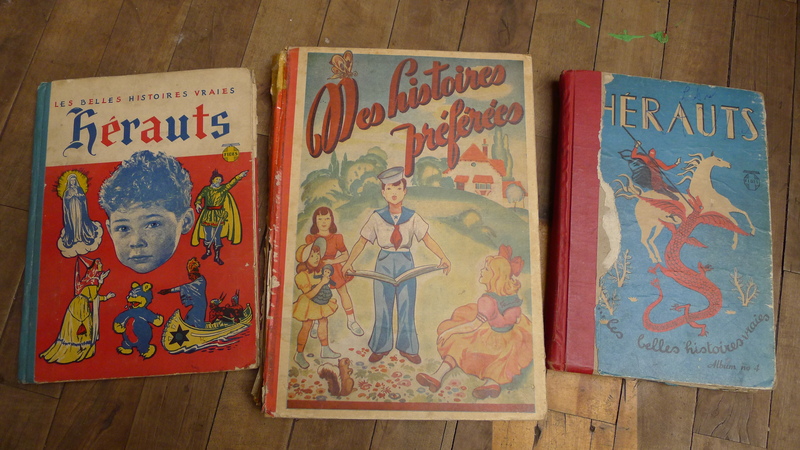 I did a bit of research and found that the “Herauts” books, which contain a series of different comics from the mid 1940s are actually fairly collectible. The book on the left, for example, recently sold for 38$ on Ebay. Mine might be in a bit better condition too. I didn’t see a price for the one on the right but it’s not in quite as good of shape – it’s missing a few pages at the end. I have another, somewhat more modern one (1950) that’s not pictured as well. I think I’ll put them up as a lot on Ebay, I’ll try to get 70$ for them. 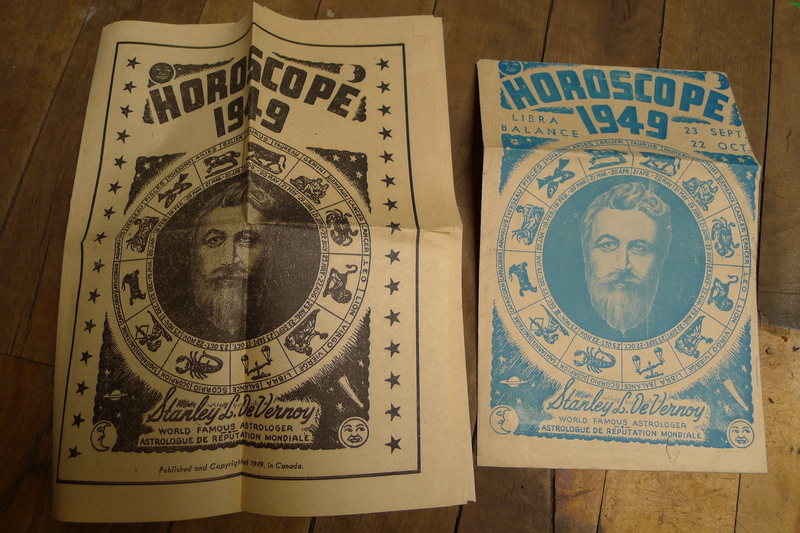 Inside one of the books was this 1949 horoscope. Inside the little pouch on the right was a year long horoscope for a Libra (on the left). It’s a really great piece of ephemera. 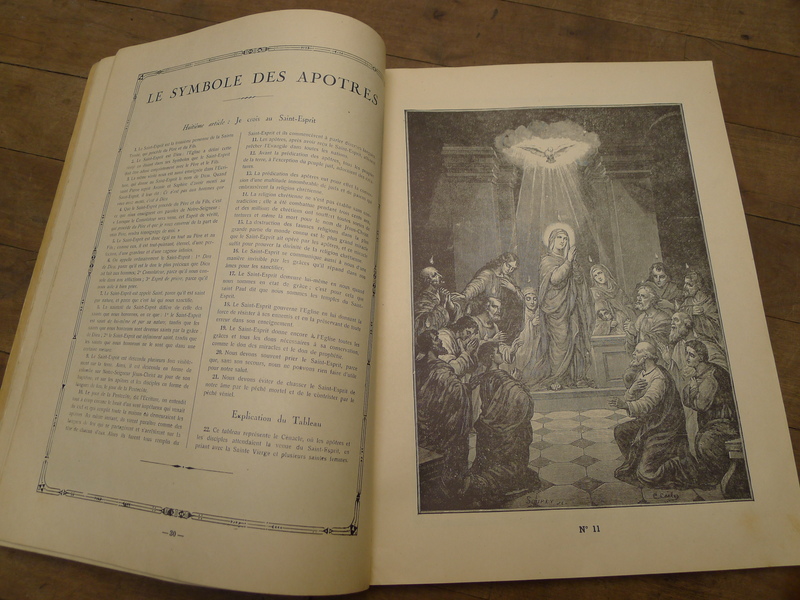 This is a cool book, published in 1953 by the Providence Saint Alexis, a former orphanage in Montreal. 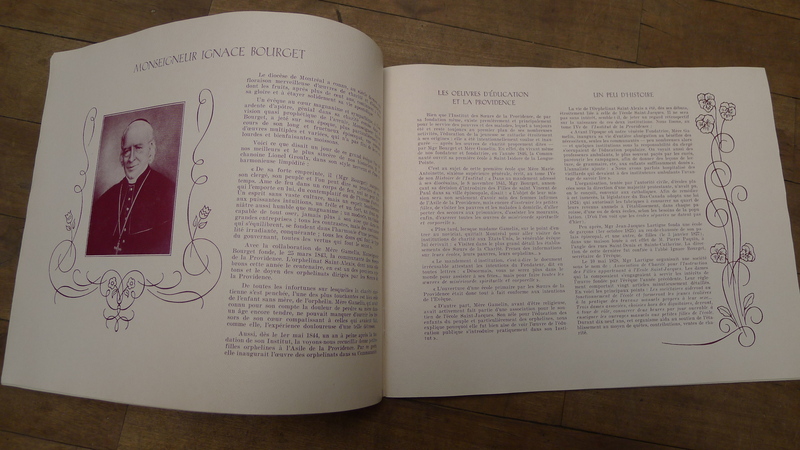 1953 happened to be their centennial year and the book goes into length about its history and the figures that shaped it. 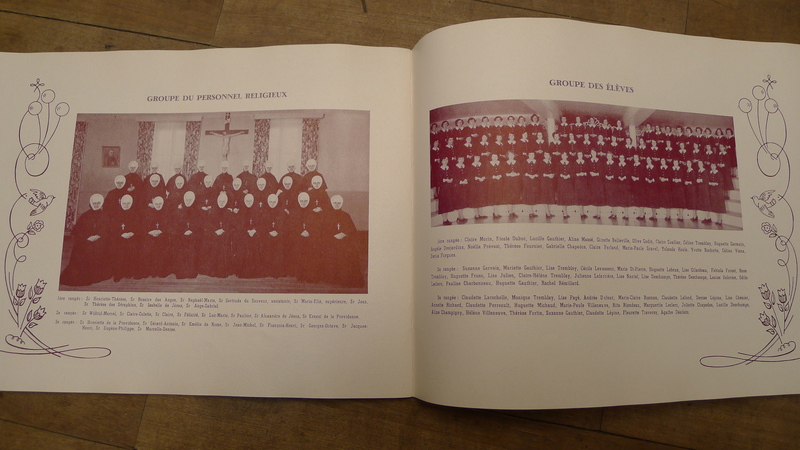 It’s also a yearbook of sorts, containing group photos (but nothing personal like you’d find in other yearbooks) of the children under their care. It’s pretty interesting, it’s the first time I see anything orphanage-related in the trash. 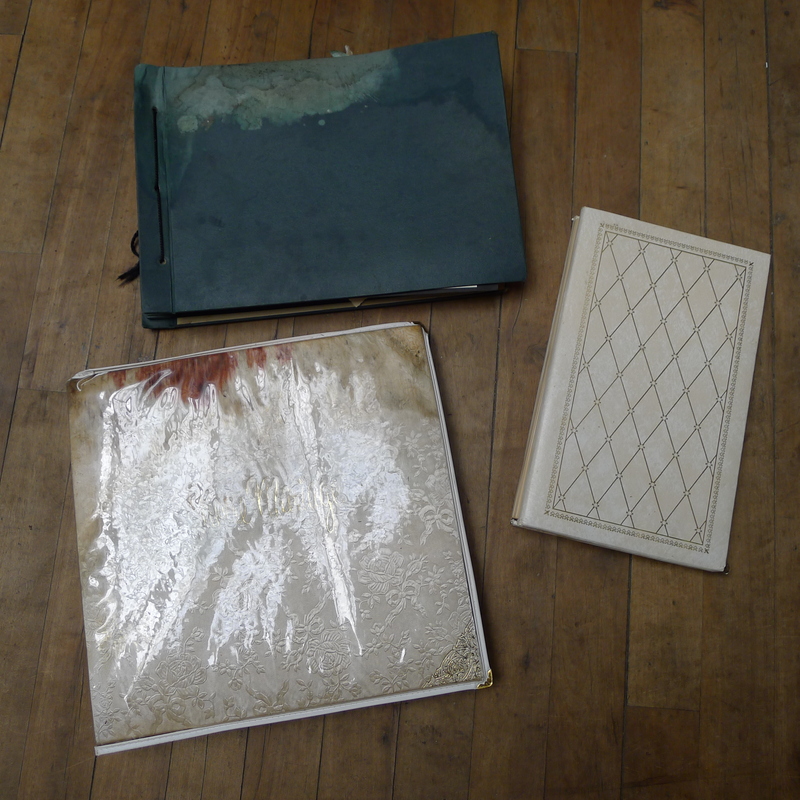 Below are a couple of pictures of the inside – like most of the other books it is in amazing condition. 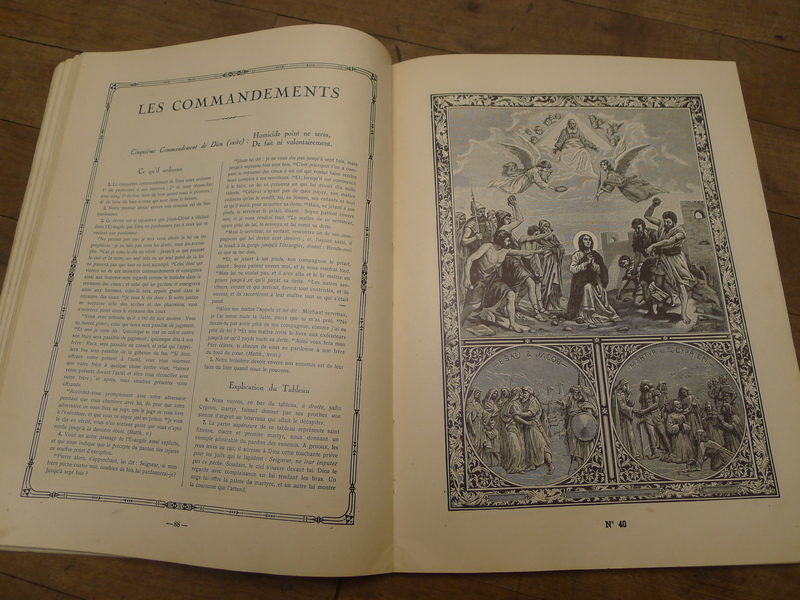 The last book is a beautiful image and text catechism. If you don’t know what a catechism is, don’t worry, neither did I. I looked it up though and apparently a catechism is a sort of manual of the religion and it’s most often used in the teaching of children. 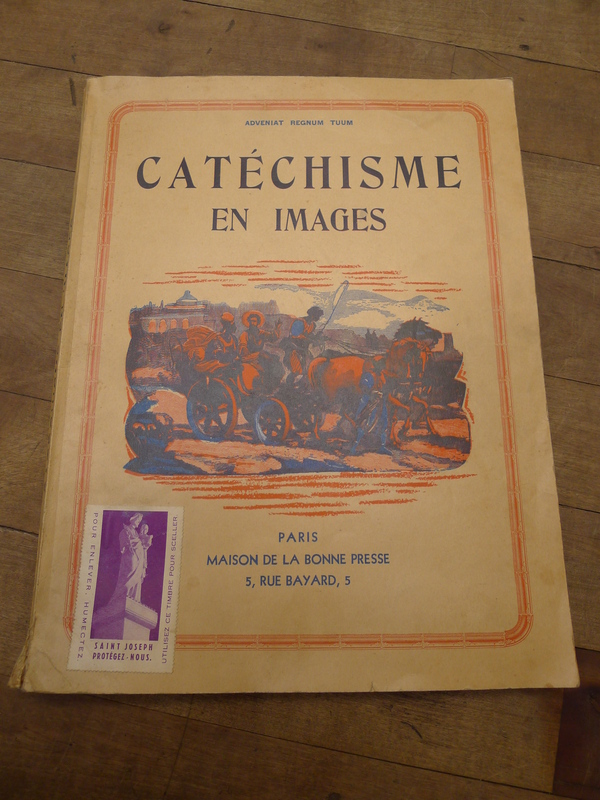 Inside the catechism were a couple of large black and white photos. 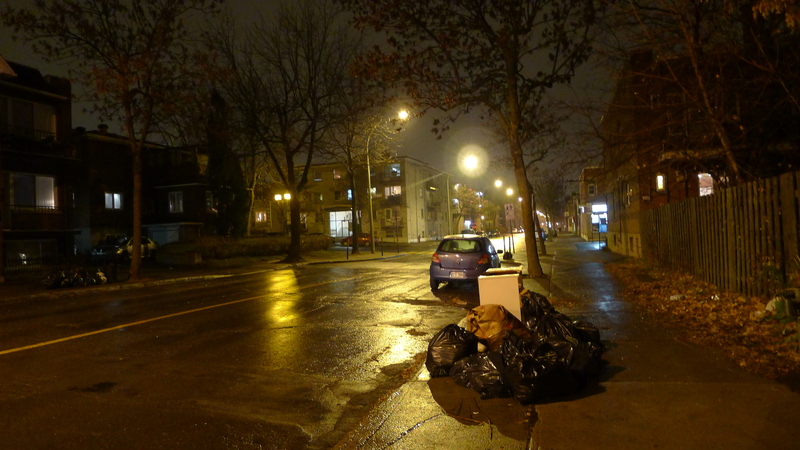 The one on the right was taken in front of the Ecole Beril (School) in Hochelaga-Maisonneuve. The Ecole Beril closed in 2011 due to mold and is slated to be demolished sometime before the new one is built in 2015. On the left is a shrine for Notre-Dame-De-Cap. That’s it for now! I’m going to the Plateau tonight to see if I can find anything else at the spot on Laval from my last post. 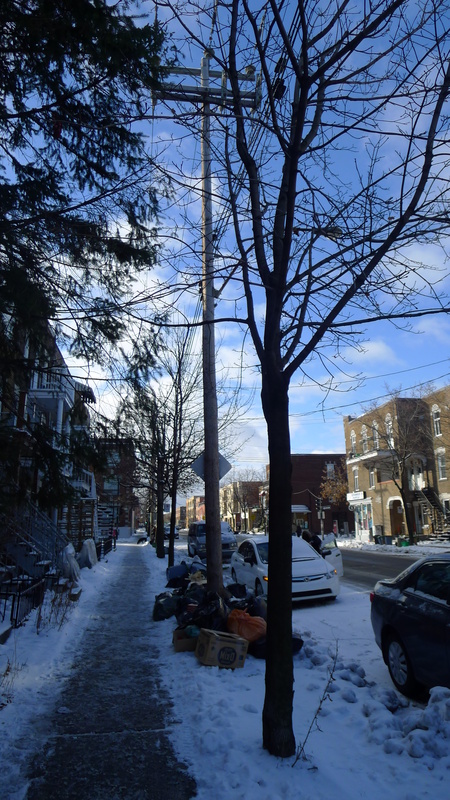 I’ll likely go to Villeray tomorrow morning as well, I haven’t been there in quite some time. I’m back in the city after spending last week back home. It’s nice to be back and doing my thing. 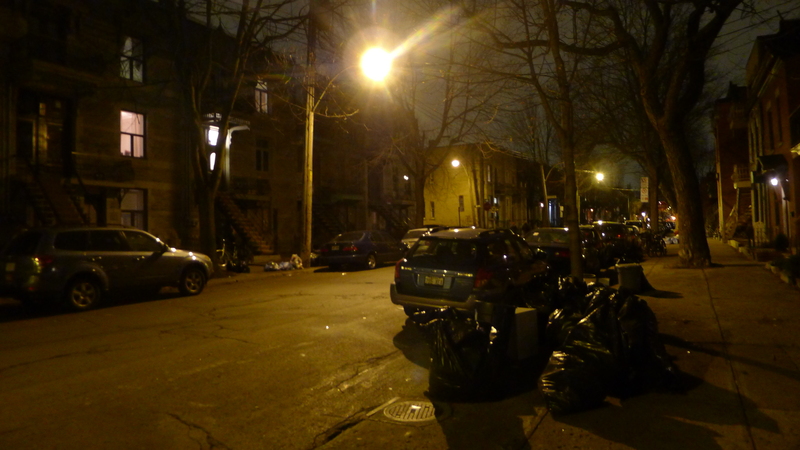 I went out to Rosemont on Friday night, mostly because I missed the whole week of trash. I didn’t really find much outside of this pile. In the bags amongst some true garbage were three photo albums. They had gotten a bit damp, probably from being in an unfinished basement. 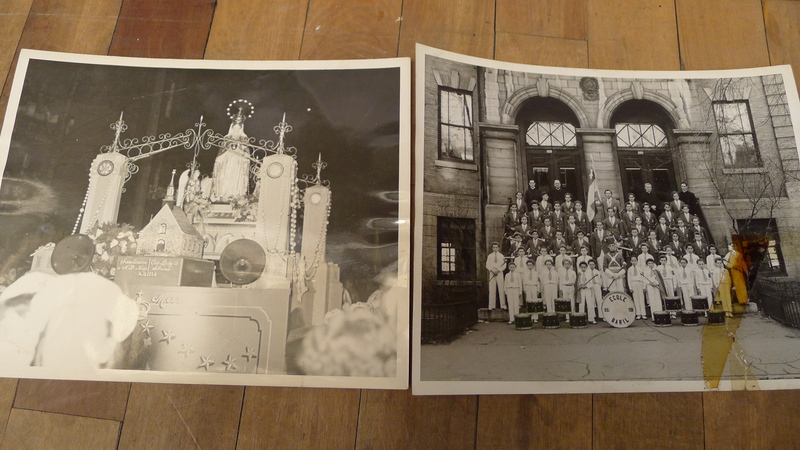 While some of the photos were ruined many were in good shape. 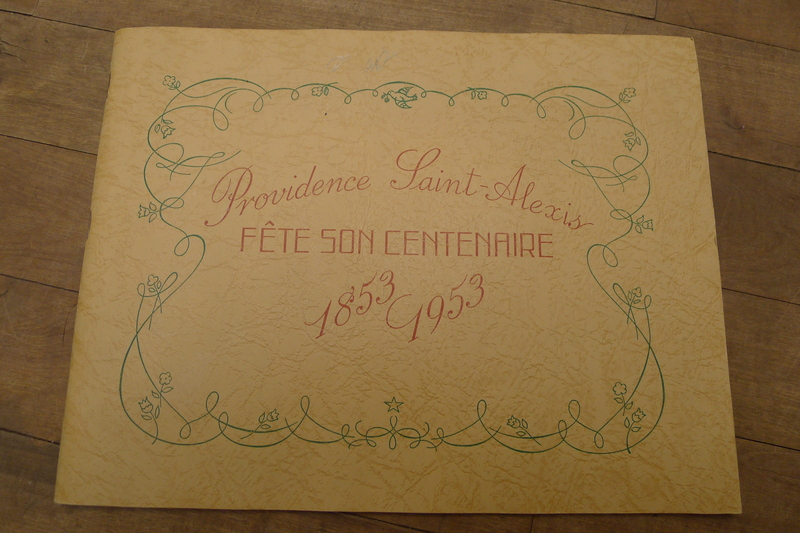 The green album contained photos from vacations to France and Tunisia in the late 40s and early 1950s. I can say this for certain because each photo is marked with a date and general location. 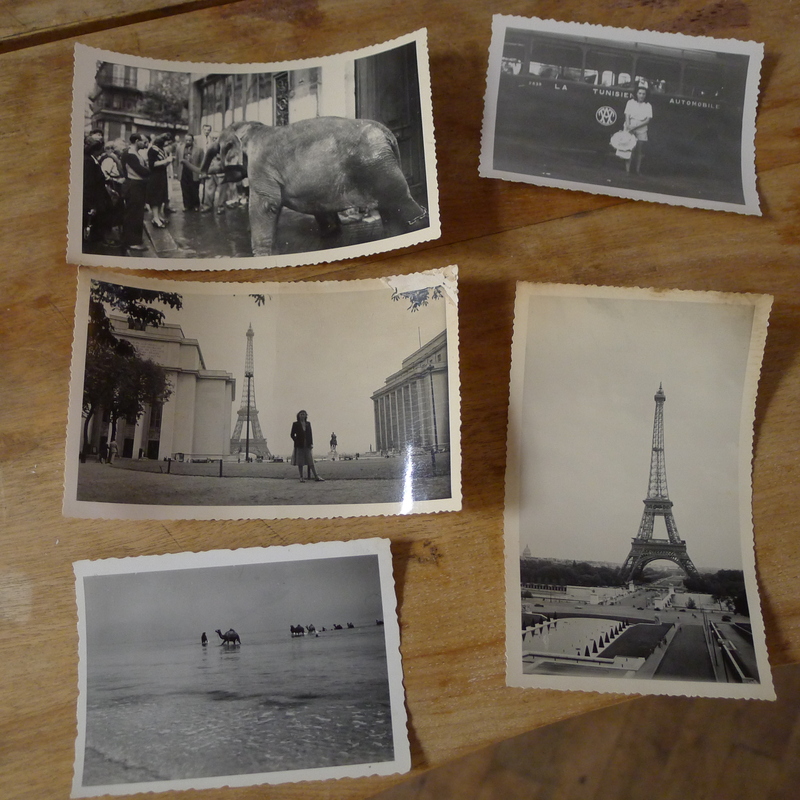 These are a few of my favourites, including a picture of a caravan (bottom left), an elephant in the streets (top left), and a couple of the Eiffel Tower. There’s a lot of other great ones, however – whoever took these photos was a pretty good photographer. One of my room-mates is from Tunisia and he appreciated seeing these old pictures. I took some of these out of the album and, after drying, the turned up a bit on the ends. If anyone has any techniques to flatten them out let me know. The only idea I have is to put them under something heavy. 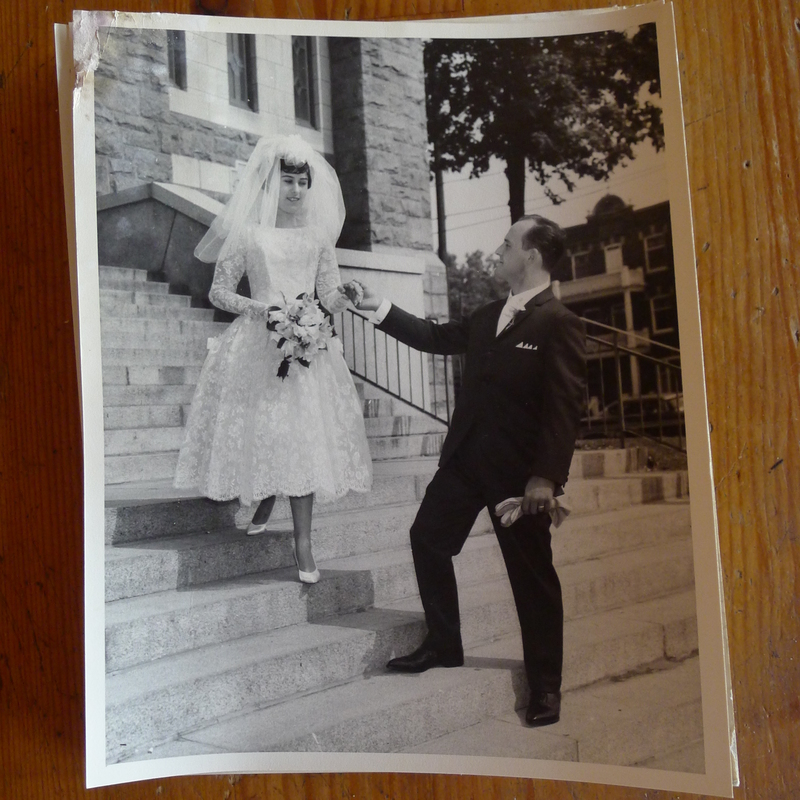 Another album contained a series of wedding photos. Based on the cars in the background they would have been taken around the same time frame as the vacation photos. I recognize the church, it’s the Eglise St Ambroise on Beaubien. All the photos are quite beautiful. I’ve been thinking about the ethics of posting people’s photography on the blog. I’m thinking that it’s not really a bad thing, so long as the subject matter is nice. If anything it might (if improbably) offer family members a chance to reclaim their photos as sometimes they are thrown out without the knowledge or permission of everyone involved. I’d like to know what you think, though – leave a comment and maybe we can get a debate started. I decided to sleep in Monday morning but made it out to the western Plateau in the evening. I often pass by on the section south of Rachel due to its high student population but I decided to change things up a bit and check it out. In this area, on Laval near Napoleon, I came across a big collection of bags that got me pretty excited, mostly because of the amount of jewelry strewn about. In the end none of the jewelry was very spectacular but I did find some other interesting stuff that made it worth my while. 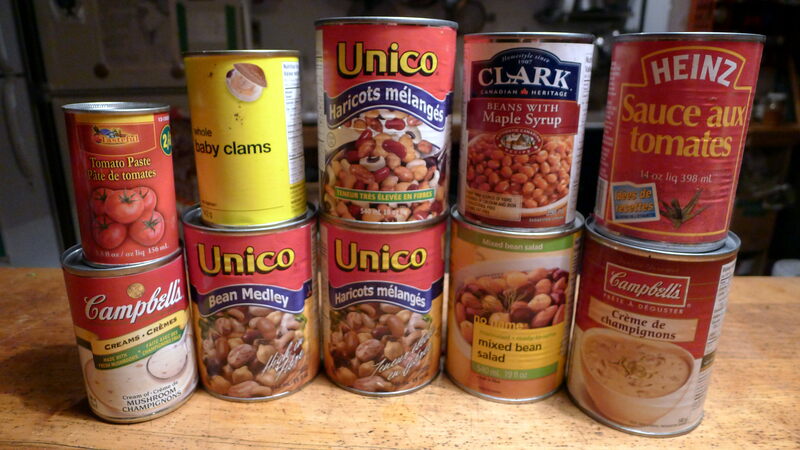 I really like the two metal containers. The one on the right is marked “Siam” on the bottom and I suspect the other one is from Thailand as well. Siam was the name of Thailand before 1939 and also from 1945-1949 so these are probably pretty old. 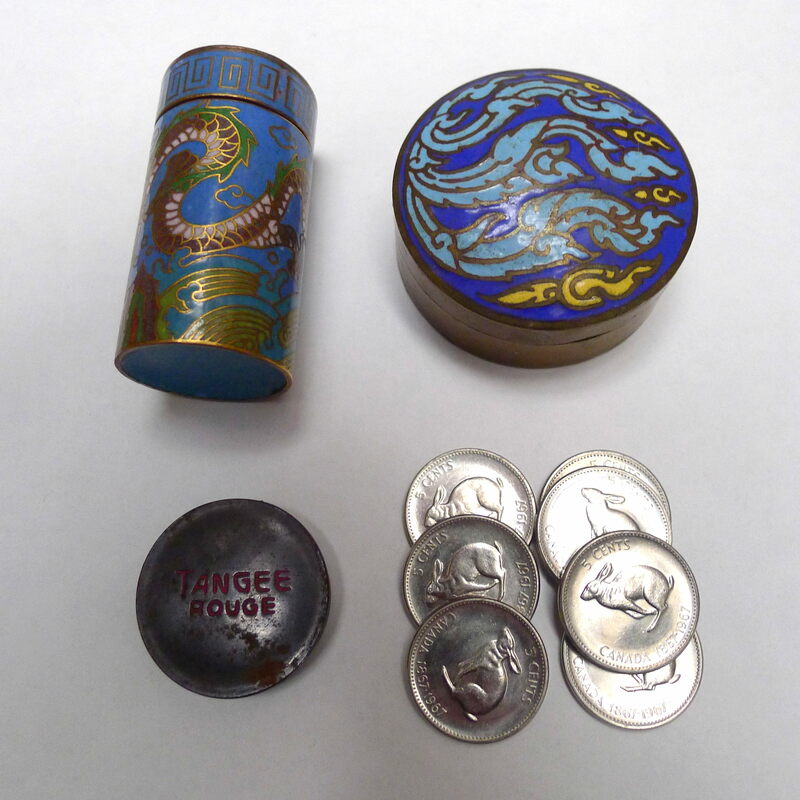 There was also a cute little rouge tin and a plastic container with seven uncirculated 1969 “rabbit” nickels. They’re not worth that much, maybe 50 cents each, but they’re still kind of cool. 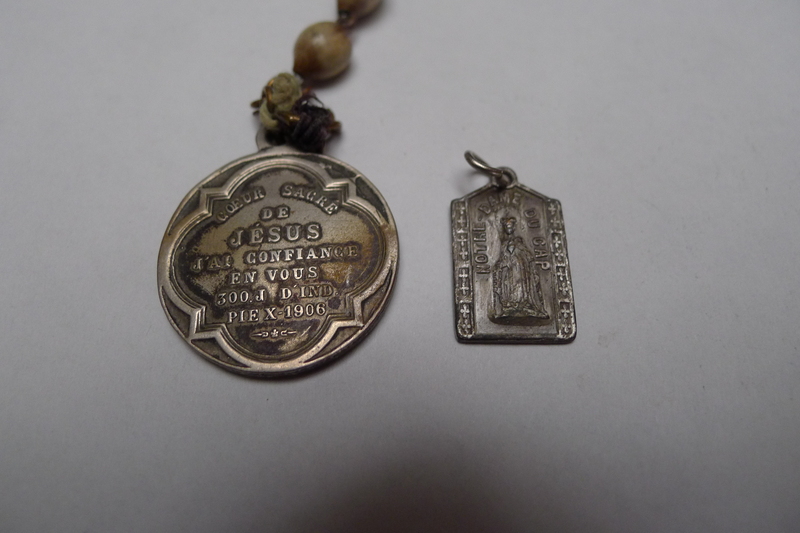 I also found a few religious medallions. These two looked the oldest, the one on the left quotes something Pope Pius X said in 1906 while the other is dated 1947. They’re probably made of silver. This “deed of land” was sort of interesting. I wondered if I now somehow owned a plot of land in the Yukon. 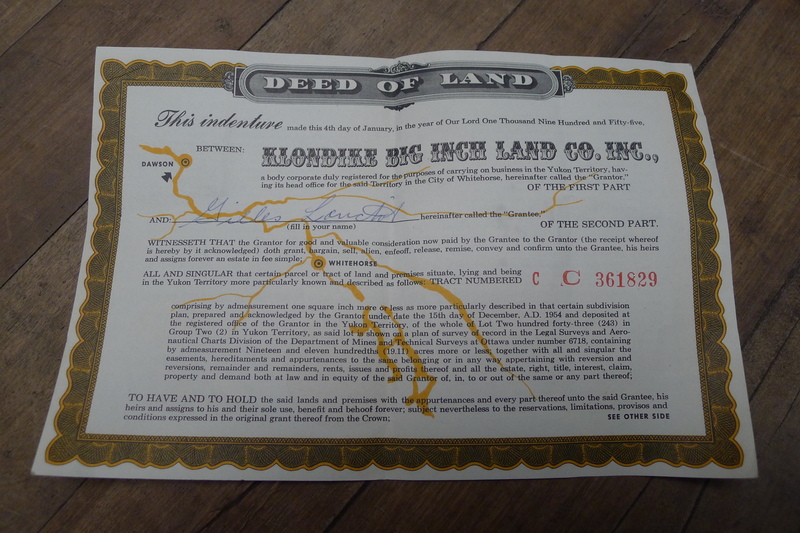 However, as it turns out these deeds, giving the grantee a “big inch” of land, were put into boxes as part of a popular Quaker oats promotion in 1955. The land was real but has since been taken back by the government because Quaker didn’t pay their property taxes. You can read more about the promotion here. These deeds actually have some collectors value, they sell from between 10-20 dollars on Ebay. There was also another nice collection of old black and white photos, most of which probably came from the late 30s to early 50s. 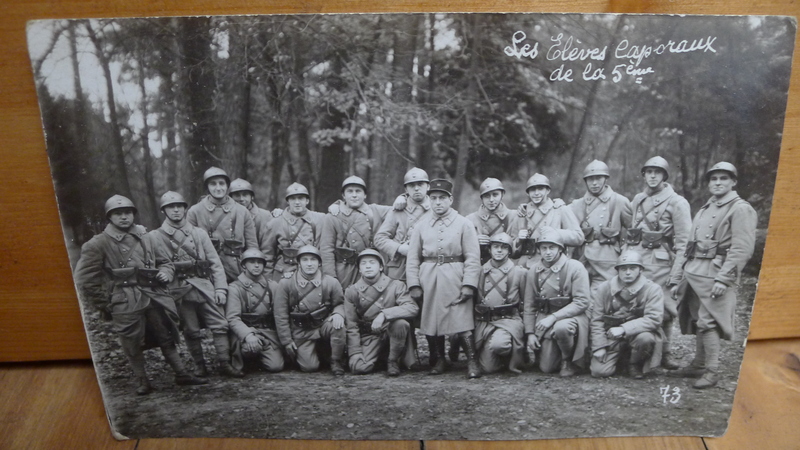 This photo postcard is kind of cool – it’s marked “Les Eleves Caporaux de la 5eme,” basically meaning that these guys were training to become corporals in the army. 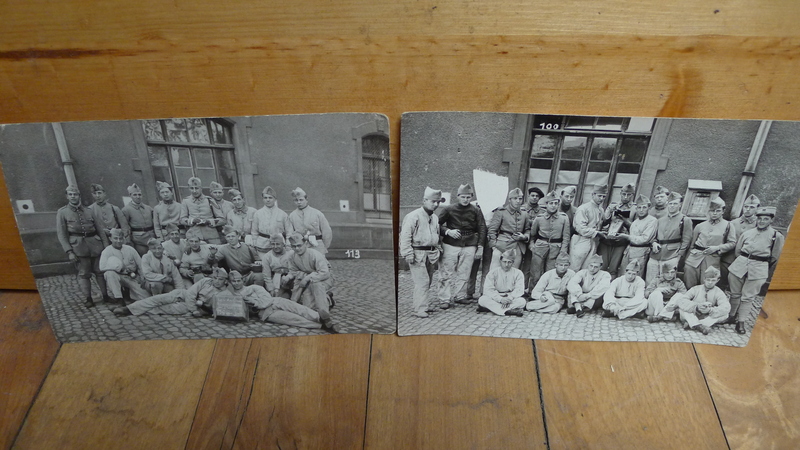 Here’s two other similar postcards. One odd thing is that the photo on the right looks to have been edited to cut one of the men from the picture. The photo itself is normal, though, meaning that the manipulation must have been on the film itself. Who knows, I might be way off base though, I’m not much of a photography expert. Regardless, these postcards might be collectible. 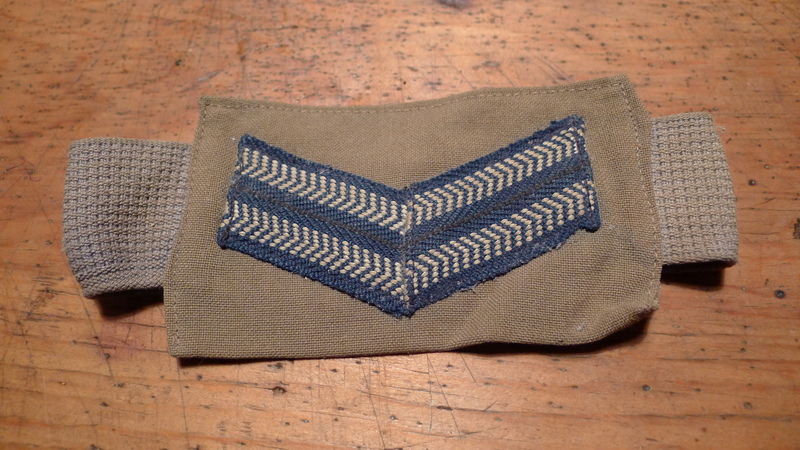 There was also this old armband which would have belonged to a private in the army. Another interesting photo. It features the Kaman 225, an experimental helicopter produced in the late 40s. 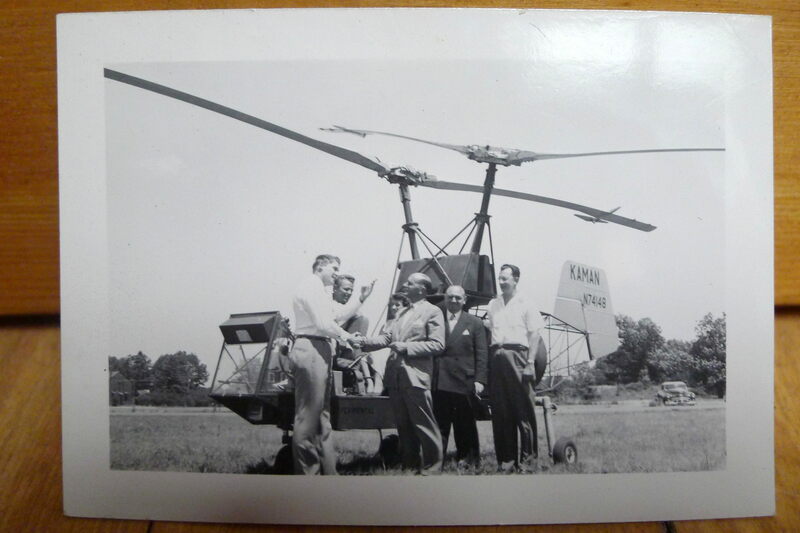 Apparently it was the first gas turbine powered helicopter in the world. While the 225 was a prototype it eventually became the HTK-1 which was used extensively by the US Army. You can read more about it here. I have a couple of pictures (and a couple of negatives) of this helicopter which may be of interest to a collector. 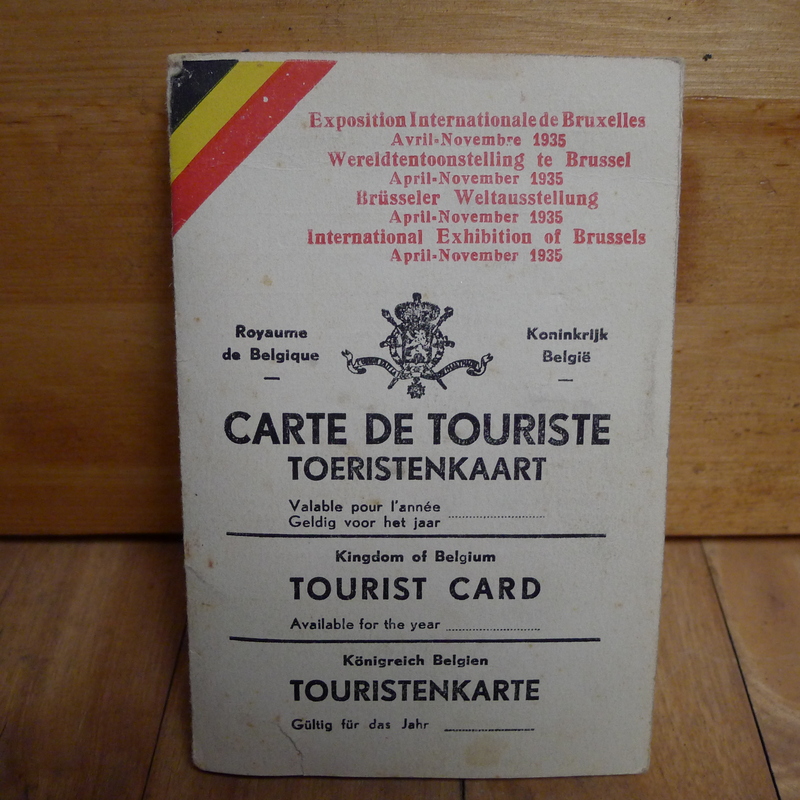 I thought this tourist passport made specifically for the 1935 Brussels International Exposition (a bit like the the Belgian Expo 67) was pretty cool as well. 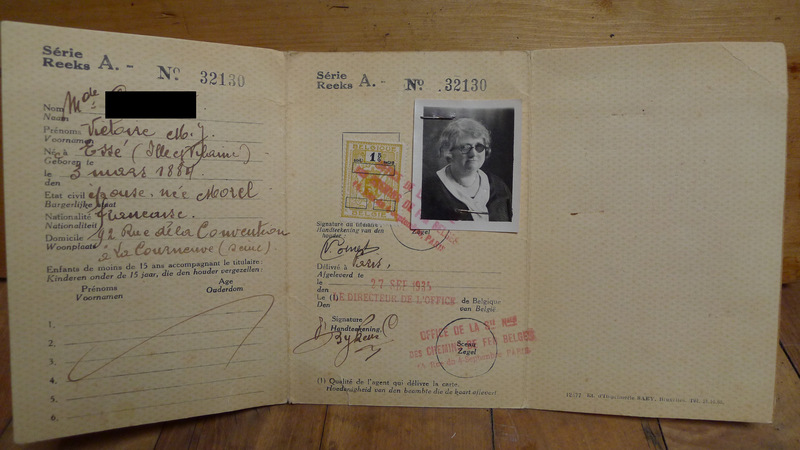 This woman was born in 1884, basically around the time of my great-grandfathers, and would have been 51 at the time of the Expo. 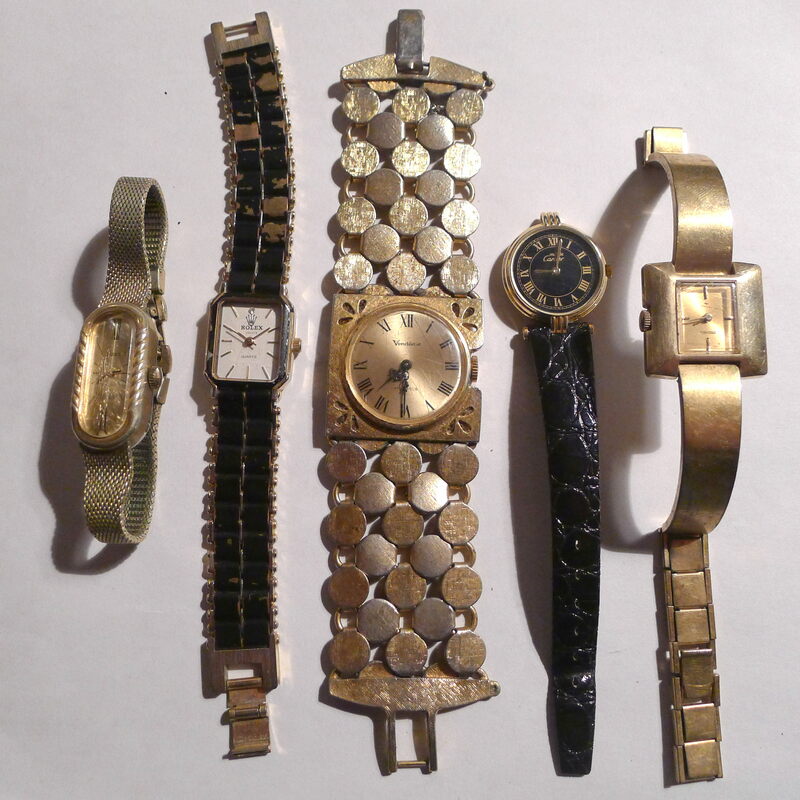 Last but not least were these old watches, all of which were held inside and old rectangular watch case. Watches 1, 3, and 5 work are manual and work, though sometimes you have to shake them a bit to get them going (they probably need cleaning / servicing). 2 and 4 seem to be quartz and probably need new batteries. 2 claims to be a Rolex but I doubt it’s authenticity while 4 claims to be a Cartier Must De. I have my doubts about that one as well but I’ll have to open the back first (with a tiny little flat screwdriver) to be sure. The nicest one might be the one in the middle, a 17 jewel Vendome with a pretty ornate band. 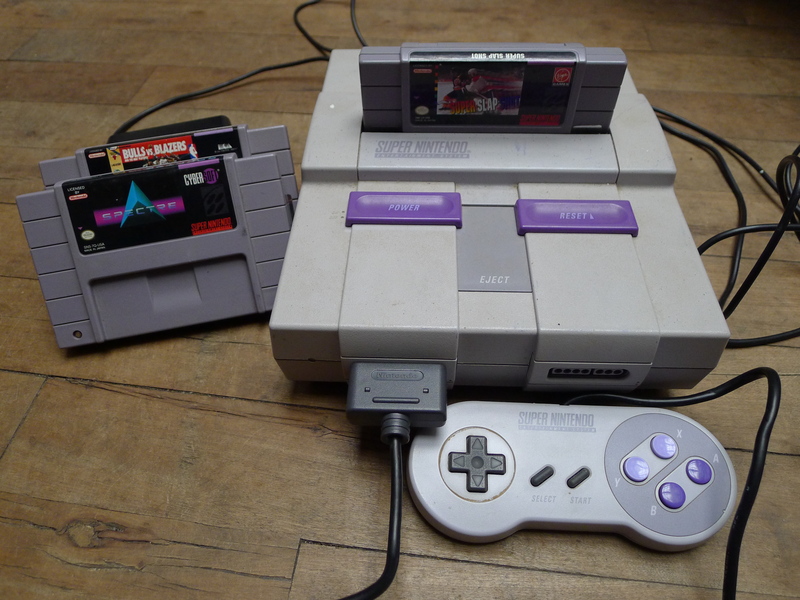 It’s pretty similar to this one which sold for 100$ on Ebay, though mine isn’t in as good of condition. The weather for tomorrow is looking pretty bad, calling for pouring rain in the hours when I would normally go to TMR. I really like my TMR shift, however, so I’m considering just going tonight. My sleep schedule has been a bit off anyways so it wouldn’t be too bad to stay up a bit late. I’ll keep you posted either way.